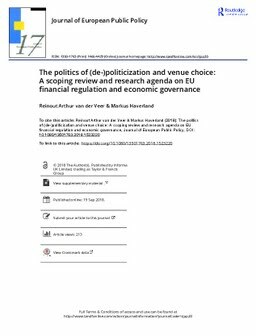 Scholarly interest in EU financial regulation and economic governance has increased sharply over the last decade, but the literature on their politics remains fragmented. We present a scoping literature review which systematically locates and aggregates academic articles on their politics in ISI-ranked journals between 1999 and 2016. We identify lacunas in this literature by mapping its strands onto the EU political system. We then present a system-level research agenda that focuses on the cycles of depoliticization and politicization that strongly characterize the politics in these areas. Future research must pay careful attention to the conditions, mechanisms and, especially the venues that (dis)allow the linkage of societal politicization to EU-level politics. This approach is deeply rooted in the specifics of the politics of these policy areas, but also draws on the strengths of research in these areas to increase its relevance for broader debates on the future of the EU itself.